A popular attraction at Victorian sideshows were hairy people. By hairy, I don't mean 70's era hippies, who threw away their razors in favor of the natural look. Hairy means hairy in the case of these "attractions." 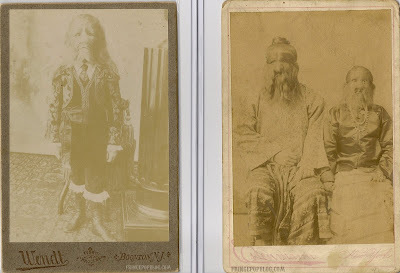 Most of the sideshow hairy people suffered from a disease known as hypertrichosis, in which thick hair grew all over their entire bodies instead of just in the typical places people have hair. I had the privilege of visiting Coney Island a few years back, and Chuy, a man suffering from the disease, was a featured act. Back in the Victorian era, the acts were usually billed with animal names (i.e. such as Jo Jo the Dog Faced Boy and Lionel the Lion Faced Boy). 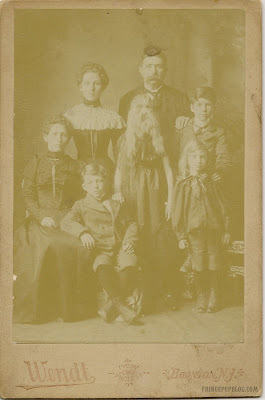 The photos show are: Lionel the Lion Faced Boy (top left), the Hairy People of Burma (top right), and The Minnesota Woolly Baby, Alice E. Doherty (bottom).